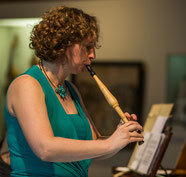 The recorder was a very beloved instrument in the Renaissance and Baroque eras. King Henry VIII owned at the end of his life no less than 78 recorders. Antonio Vivaldi has composed marvelous recorder concertos and Bach composed about 25 cantatas with recorder. Renaissance recorders are quite different from Baroque ones. Nearly all of them have a cylindrical inner bore with large fingerholes. This produces a firm sound, but limits its compass to an octave plus a sixth. Treatises of Virdung (Basel, 1511), Agricola (Wittenberg, 1528) and Ganassi (Venice, 1538, amongst others, reveal descriptions and pictures of these recorders. 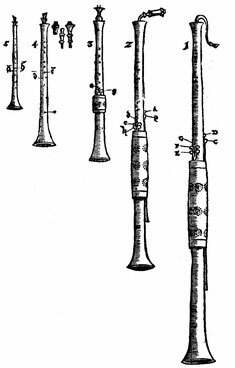 With Praetorius (Wolfenbüttel,1618) and Mersenne (Paris, 1636) there even are pictures of the complete recorder family from the 'Garklein Exilent' of about 5 inches to the great bass recorder of about 6 feet. These instruments are still played in homogeneous consorts (recorders only) or together with voice, lutes, viols and harpsichord (broken consort). In the course of the 17th Century the recorder evolves from an ensemble instrument into a solo instrument. Little books like 'Der Fluyten Lusthof' (Amsterdam, 1649) and 'Der Gooden Fluyt-Hemel' (Amsterdam, 1644) appear in print: exquisite testomonies of variation series on popular tunes of those days, probably played on one-piece, slightly conical little recorders that can often be seen on early 17th Century iconography. The search for more elegant instruments with larger compasses continued and led to the creation of the Baroque model by members of the Hotteterre family. Around 1660 the cylindrical bore was replaced by a narrower, conical bore (which facilitates the respons of high notes) and the one-part body by an articulated one in three parts (facilitates a more detailed finish). 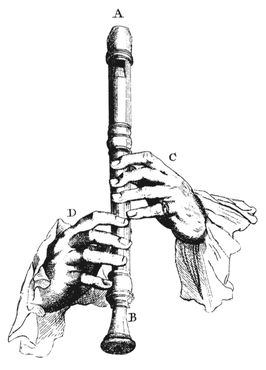 The flageolet is a small recorder with six finger holes, arranged in a quizzical way: four holes at the front of the instrument and two thumb holes at the back. Initially some models were meant to be used during singing lessons for caged birds. A sponge, inserted in the bulge of the insufflation tube (between the mouthpiece and the labium) catches the moisture from the musician’s breathing in order to limit the effects of condensation in the instrument. Flageolets also come with valves. Since the first years of the 19th Century, the French flageolet is a great success amongst amateurs as well as with professional musicians. Many methods and studies for flageolet are published to help the amateurs blow their first tones or for the accomplishment of professional musicians. Even the young Berlioz is known to have played the instrument. Mainly in the field of dance music the instrument managed to distinguish itself, to the point of its name being associated with the quadrille. The flageolet is used for solos, but also in duets or as part of small ensembles to start the figures of quadrilles, waltzes and polkas. Its penetrating sonority was a trump card in balls, as in this way the melody could always be heard by the dancers, in spite of the buzz of the people and the sound of the feet hitting the ground. There is also a more serious repertoire, such as studies, concert duets and the varied themes by Carnaud (around 1835) and later the caprices by Bousquet (1864). Among the most famous flageolet players we have to mention Edmond Collinet, a virtuoso in dance orchestras and in the ‘Théâtre des Variétés’ in Paris. The shawm was a double-reed instrument which was most popular throughout the Middle Ages until the early Baroque era. The shawm belongs to the large family of double reed instruments, many of which are found in folk music. The early historical shawm is of Arab origins, first encountered by the knights and tradesmen during the Crusades. It eventually found its way to the west during the Iberian conquest by the Moors (711-1492). As a small instrument, it was played by jugglers, who were travelling freelance musicians who made their living through music making and other artistry. trumpet. Such ensembles, producing really loud music, were called 'alta capella’ as compared with those with softer-sounding (strings, flutes, harps, lutes) which were called 'bassa capella'. They were very widespread in the towns and mediaeval courts of the later Middle Ages, playing a wide repertoire of quite virtuoso music (signals, dances, polyphony). The polyphonic music of the Renaissance required instruments of different dimensions, and shawms began to be built in families or consorts. This picture, reproduced from the 'Syntagma Musicum' (1618) by Michael Praetorius, shows the other members of the shawm family: little shawm, shawm, alto shawm, basset or tenor shawm, bass shawm. Instruments producing a loud sound were much appreciated by professional musician, who, over time, had acquired a clear professional status as municipal musicians. They played most often as a group composed of a shawm, a cornetto, two alto shawms, a sackbut and a bass curtal (bassoon, dulcian). Note that the lower bombards have been exchanged by the more flexible sackbuts and bassoons. The dulcian or Renaissance bassoon appeared in the middle of the 16th Century. This new instrument consists of a block of wood with a U-shaped inner bore and is therefore two times shorter than its shawm counterparts. At the front side the instrument has six tone holes and one key. The parallel secondary tube has two tone holes and one key. These can be closed with the thumbs of both the hands. In doing so, one calls for very low notes. The soft sound of the dulcian is perfect for playing Renaissance music. Like most other instruments, this instrument comes also in descant, treble, tenor and bass pitches. The MIM museum possesses a complete set, which has been measured and copied regurarly. Crumhorns (German: Krumhörner) with their curved up bottom ends belong to the more curious Renaissance instruments. Its sound is also very funny. It is produced by a reed inside a windcap and therefore the reed is not blown into directly. The MIM museum owns an original 16th Century set with the original case! Musical tastes began to change around the second half of the 17th Century. Composers wanted wind instruments to play alongside the strings in orchestras. A new instrument called the oboe was developed by the Hotteterres, a family of instrument builders, who's work became very fashionable throughout Europe.